Get out there and visit other colleges, BU Students! BC is hosting a great event and it’s an awesome opportunity to venture out of the BU bubble and see what other schools are like and what types of things they are doing. Check out this event, you won’t regret it. 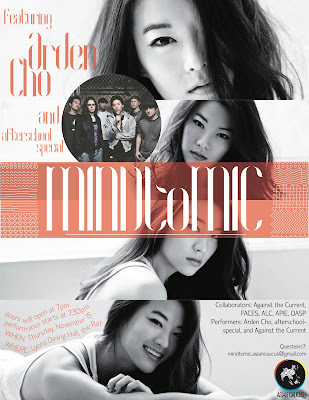 Event Description: For this year’s 8th Annual From Mind to Mic performance, Asian Caucus is proud to present Boston College with Arden Cho and afterschoolspecial, two up-and-coming performers that highlight Asian-American success in the entertainment/music industry! Arden Cho is a Korean-American youtube star with a background in modelling, as the covergirl for Clinique in Asia, and in singing/acting. afterschoolspecial is a band fronted by DANakaDAN who plays a unique blend of rap, pop, alternative, rock, and hip hop. Come enjoy a free performance and meet the stars that are making it big! After the performance there will be a Q&amp;A session with the artists, as well as a meet and greet.